Misty Mountain is a 280 hectare South African Natural Heritage Site situated on the spectacular Long Tom Pass (31 kilometres from Lydenburg and 24 kilometres from Sabie), Panorama Route, Mpumalanga, South Africa. Perched at an altitude of 1700 metres above sea level in a malaria free area, Misty Mountain is uniquely set in mountainous countryside with majestic views across the escarpment and into the lowveld. Conveniently situated on the Panorama Route, Misty Mountain is an ideal base from which to explore the Mpumalanga escarpment (God’s Window, The Pinnacle, Bourke’s Luck Potholes, Blyde River Canyon) and world renowned Kruger National Park and adjacent private games reserves. 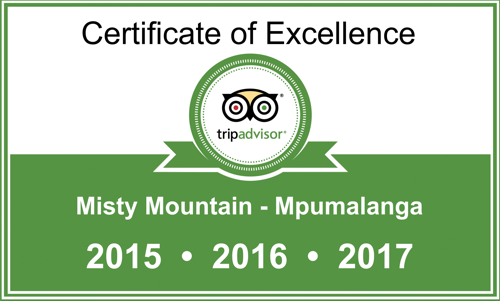 Misty Mountain is a relaxed, informal, family friendly, owner managed establishment. Owned and operated as a lodge by the Sheard family since 1974, Misty Mountain is a place of tranquillity and natural beauty.